Someone once asked me what my favorite family tradition was and at the time I did not have one. Now I do. 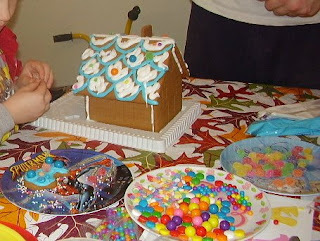 This is our third year of making Gingerbread something at Christmas time. We tend to do a mix of whatever kits the kids pick that year. However we do plan to start creating our own design’s, as the kids get older and more creative. Every year we buy a gingerbread house and gingerbread train kit and then spend the good part of a day making them with our kids. 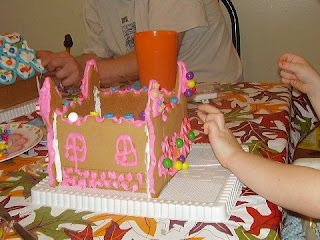 This year our son picked the gingerbread house and our daughter picked the princes castle made with vanilla cookie. Out of the box every thing comes, all the candy on plates and the icing bags all ready to go. So the fun part is getting everything to hold together. It did not work so well last year, but this year it was perfect. 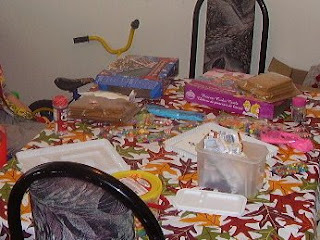 Then Mom and Dad put the icing on and away the kids go, putting candy every place they can, including inside themselves, lol. As always we have a lot of fun creating these, however I did notice that for every candy that went on the princess castle one went into our daughter. Can anyone say – sugar high! We went for a walk once we were done just to burn off all the candy our kids ate. They had way more then they are used to. I think the gingerbread house and princess castle look great.